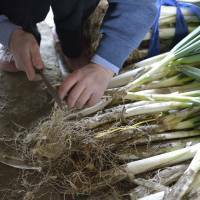 “Soil is a living thing” is almost a mantra for Sakae Suka, wife of Kazuo Suka, who has practiced shizen nōhō (natural farming) in Kamisato-machi, Saitama Prefecture, for more than 60 years. Truly the father of natural farming in our Kanto area, Kazuo has quietly and gently mentored most of the organic farmers or producers in our area, including my husband, Tadaaki. We live in the next town over, and in recent years I find my way to the Suka Farm much more frequently than when I was raising my three sons and struggling to get through days jam-packed with home schooling, running an immersion school, cooking and helping in the field (when I could!). These days I don’t home school anymore, but I write. Writing is a (gloriously) solitary pursuit, though it can also be a tad isolating. 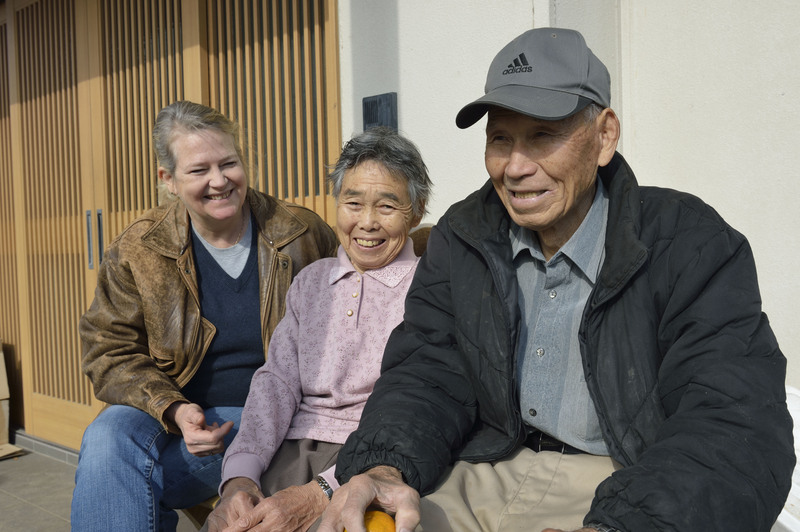 I go to the Suka Farm not only to pick up vegetables that we are not growing ourselves or some organic pork that their daughter-in-law Junko sells from her entry-hall freezer, but also to catch a few minutes with two people in my world who leave me feeling valued for our common bond. I always walk away from talking with Ba-chan and Jii-chan (as we call older folks in Japan) with some invaluable piece of knowledge about the growing process or increased understanding of the ways of country life, despite having lived it myself for 24 years. 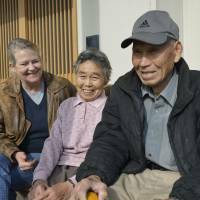 In August of 1948, Kazuo’s liver began to fail, and the doctors told him that no medicine would save him and that he would certainly die. Still in his 20s, with young children, dying was unacceptable. Searching for other options, he discovered that eating all-natural foods could repair his failing frame. It took one grueling month for his body to molt off the toxins of modern food, but by the autumn, Kazuo had returned from the 50 kg wraith that he had become to his normal weight of 70 kg. When asked why their vegetables are so powerfully flavorful, Kazuo cuts open a carrot to show its core. It is not the usual yellow, but exactly the same color as the outside portion. “This carrot grew as it should; it is perfect.” Sakae tilts her head to the side and with a confident smile tells me that “if you look at the shape, you can understand the soil.” I often call her the Tsuchi Obachan (Earth Grandma). The Suka family’s negi is sweet, yet pleasantly hot. 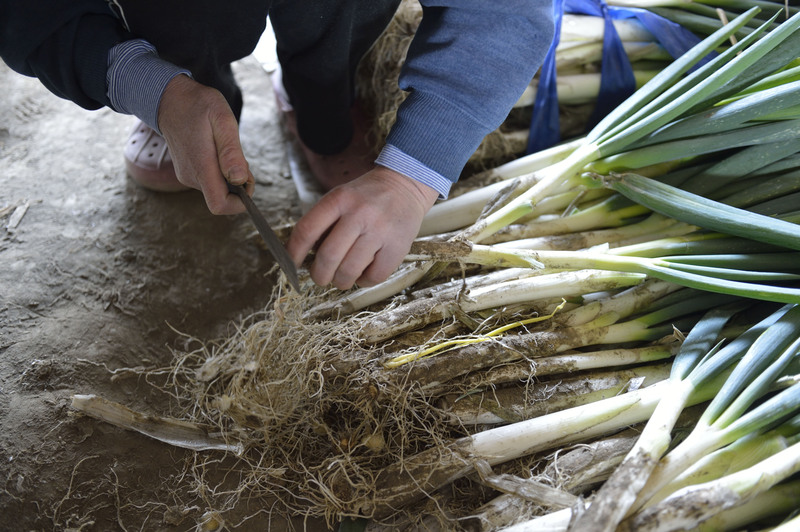 Sakae explains that “the long roots show the health of the negi.” She laments that the ends, which are closest to the earth, must be lopped off and discarded, or that the tops closest to the sun are trimmed to fit the negi in a box. The part of the plant that “touches” the soil or sun contains the most natural energy. Sakae advises dropping the tops and ends into your stockpot for extra flavor. What impacts me the most about touching, cooking, or eating the Suka family’s vegetables is that I can taste the years and the heart that went into growing them. And that I have taken a piece of Suka Jii-chan and Ba-chan home with me. Creating relationships with producers or purveyors outside of our immediate circle is a way to establish a connection to the world outside of our own and to feel a part of a supportive community that was once the only way of life in Japan. It’s a way to feel like we belong. The Suka family’s vegetables are available on a rotating basis at Kinokuniya and Santoku supermarkets or in subscription boxes from Yamaki Jozo (info@yamaki-co.com). Nancy Singleton Hachisu is the author of “Japanese Farm Food.” A Stanford graduate, she is married to a Japanese organic farmer in rural Saitama.